Brief Synopsis – The daily workings of a traveling 3 ring circus from the animal trainings to the trapeze artists to the clown who make everyone laugh. My Take on it – This movie is truly nothing to write home about. There are a few interesting circus feats that are enjoyable to watch, but there isn’t much of a plot or interesting characters since everyone is a caricature of known circus acts. There’s even a clown who refuses to ever take off his face paint played by Jimmy Stewart. 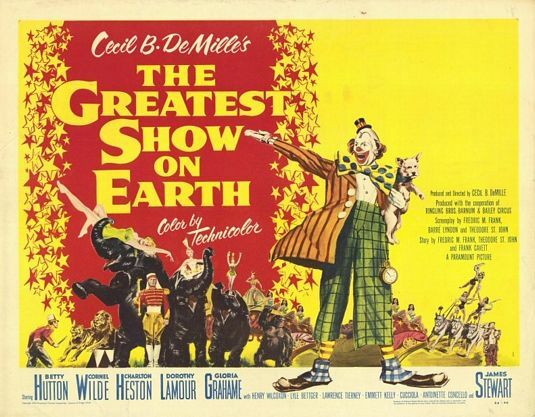 The director, Cecile B.DeMille was such a perfectionist that he forced every actor to do there own circus stunts. This movie is known for being the most politically charged choice for a Best Picture Oscar. DeMille was loved by everyone for so many years and it’s rival High Noon (1952) had too many Communist undertones to it including a writer who was blacklisted by Congress, so this movie won Best Picture because of the fear of Academy members of the HUAC committee. Winner of 2 (of 5) Oscars. It won Best Picture and Best Story. This movie is just a spectacle for the circus acts and nothing more. The year High Noon was robbed.